Types of Sentences Quiz. 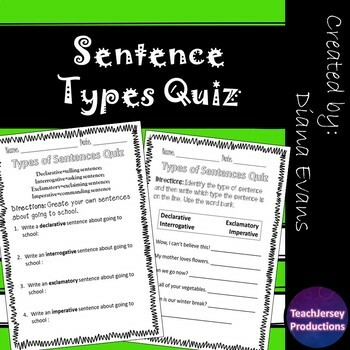 Could be used as an in class activity, homework or a quiz to assess student knowledge of types of sentences (declarative, interrogative, exclamatory, and imperative). Students will have to identify the types of sentences, as well as write their own different types of sentences.